When does a bad customer review become harassment? For Layla Farucci, who owns the Charter Oaks winery and art studio in California's Napa Valley, that line was crossed many reviews ago. That's because she thinks the thumb's downs are from one person using different aliases. One of the reviews, which appear on Google Maps, called the winery a "toilet," while others described the wine as "rubbery" and the staff as "manipulative, calculating and pompous." Farucci hasn't held back in responding to some of these complaints. She wrote in one comment: "This TROLL never entered the winery/ Art Studio. We keep records. You can't review when you've never tasted or experienced the art or wine, BOXED, RUBBERY?!? Shame on you Joe Troll! Farucci has asked Google to take down the reviews, but the search giant has not done so, she said. "As an owner I think that Google should listen to me, and they won't." As a result, Farucci is suing the search giant, whose corporate parent is Alphabet, in small claims court, in hopes of forcing it to remove the reviews. She argues the postings violate Google's own policy of forbidding fake reviews aimed at affecting a business' rating. 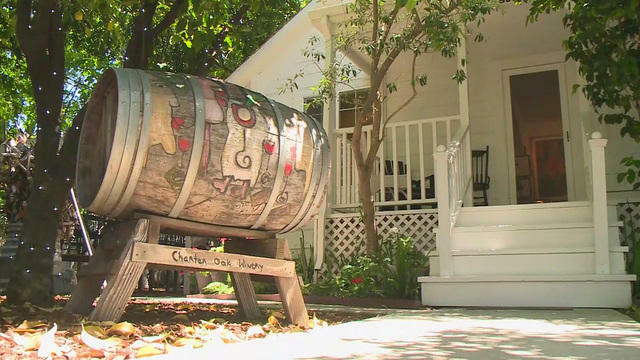 The reviews are more of a personal attack on her than an evaluation of Charter Oaks winery, she told CBS San Francisco. "If he said, 'I don't like the art,' fair game. If he said, 'I don't like the wine,' fair game. But he never speaks about the art or the wine." A hearing is scheduled for June 12. Negative customer reviews have been the subject of lawsuits by doctors, contractors and even mattress companies complaining about unfair critiques. But lawmakers have tended to side with consumers, recently passing a law protecting people's right to gripe online. That's as long as reviewers are truthful, however. And the courts have allowed businesses to learn the identities of anonymous reviewers when they have reason to believe reviews aren't truthful.